In two short months Green Acres Brenham will be two years old. I can't believe it, the time has zipped by and more surprising was the amount of great followers I have. I never expected it, Green Acres Brenham started on a whim one evening and grew from my first post. I have several hundred to thousands of visitors a day, had many wonderful offers and experiences through Green Acres Brenham and met lots of wonderful people. Southern Living Magazine even follows my blog on twitter and has asked to photograph my home and ideas. It's been a great experience. I had no idea. Today's post is short and sweet an end of summer recipe and a travel destination to visit for fabulous ideas (not to mention it's my favorite place to retreat to). Both ideas today are from two of my FAVORITE magazines Southern Living and Martha Stewart Living, I'll post their sites with the information I would not want someone thinking I plagiarized anything, plus it's not everyday we can all be creative and have original ideas one after the other. If you have the opportunity to visit one of the Southern Living Idea Houses, GO!!!!! I have in the past and they are great to see, so imagine my excitement when the 2011 Southern Living Idea House was in Horseshoe Bay, Texas. If you know me, than you know our favorite place to relax is Horseshoe Bay. We have had a townhouse their for about eleven years and we love everything about it. If you are a water/outdoors family and love boating, the lake, tennis, golf, fishing, watching the deer and all in a beautiful setting then Horseshoe Bay is a trip you need to plan. If you plan a trip then go before October 4 and you can see the Southern Living Idea House, it's located off FM 2147 (plenty of signs). The Idea House is open Wednesday-Saturday from 11:00a.m. - 5:00p.m. and Sunday from 1:00p.m.-5:00p.m., closed Monday and Tuesday. Admission is $10,if you can't make it to the Idea House, go to www.southernliving.com and watch the tour. How they keep it so perfect when 20,000 people will have gone through it by October 4th, I have no idea. It's a challenge with four people in my house. Choose a white wine (Sauvignon Blanc or Pinot Grigio), mix in orange liqueur, fresh ginger, lemon juice, basil or mint leaves. Add fruit (pineapples, peaches, etc..) It's all a matter of personal taste on how much you'd like to throw in and it can be made a day in advanced. 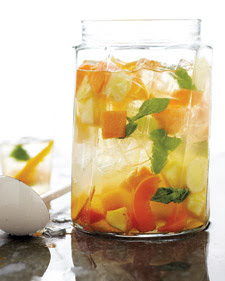 To all my followers, enjoy the Southern Living Idea House (either in person or online) and let me know how the Summer Fruit Sangria was. I was (maybe still will) planning a tutorial on making bows, people ask offend "how to" make bows for their packages (I love a pretty bow on a gift). I am thinking about hosting the tutorial in my workroom and have a hands on experience, you can sign up online. My only concern is security and safety, recently I acquired a stalker and they know where I live, etc. (I do not know who they are, crazy how that works they can stalk you and get to stay anonymous hence my hesitation to host a tutorial in my workroom).. It's a very scary situation and authorities have been notified, at first it kind of cracked me up, but I should have taken their comments, threats, etc... more serious. Keeping our precious children safe at any and all means necessary is our first priority (wouldn't it be for any parent). We are and life continues (but with caution and extra safety measures). Thank you to all my followers. Enjoy the end of summer.